Spring industry guest lectures got off to a promising start with MEL–MHLP organized Leadership Seminar Series on Friday, 24 March that brought two industry leaders, Brett Robinson and Adam Lorant, to the CHBE Building to speak to graduate and undergraduate students of Applied Science professional programs. Trevor Stuthridge opened up dimensions in innovation. Brett struck the tone of strategic versus tactical leadership. Management is about the “things” while leadership revolves about people. Brett linked how leaders in positions of power and influence communicate to the Milgram experiment, and the unwitting obedience to authority figures that lead to wrong decisions made. Leadership is defined by honesty, integrity and humility. Humility is confidence. Integrity is the courage to question authority to be ethical and do the right thing. Leaders need employees with the integrity to challenge and support them. Small things make a big difference in people management. A surprising practice Brett follows is “Praise in private; criticize in private.” Leaders lose credibility when they single out a few employees for public praise yet leave others who contributed equally or more to that effort and its success. It leads to quiet resentment in the workplace and disrupts work relationships between those who were praised and those who were ignored, however unintentionally. Adam’s pathways in innovation began as a promising engineer at Nortel from where he made his mark as a serial entrepreneur that deservedly earned him Canada’s “Top 40 Under 40” award. Innovation is a core aspect of leadership and Adam’s trailblazing ventures in technology start-ups, consolidating their stature and selling these successful companies is a master class in leadership. “Dream, communicate the dream, validate, hire the right people, execute and then repeat”. And Adam has accomplished those values, time after time with each company he launched and developed. Trevor’s guest lecture on April 10 came at the invitation of Mark Martinez, Director of the Pulp and Paper Centre as part of the series, Industry Nights. Trevor’s slant on facilitative leadership also developed on the theme of innovations. It means staying ahead of the industry through research, optimism and risk management. Innovations involve strategic partnerships with governments and industry as no single entity can succeed alone. Trevor worked with “coalitions of the willing” in the innovation value chain, managing risks and rewards. New coalitions formed every two years with new projects opens doors for new partners and new risk takers to enter alliances. A good place to begin would be as the research geek at university setting up alliances and partnerships that augment in value over time for those who invest in the worth of building their “people skills”. “Contrasting leadership styles yet each one pragmatic and highly successful”, says Ralohn Hunt — MEL student with 7 years of industry experience —who attended all three Spring seminars. And an endnote to these spring seminars … leadership is fun. 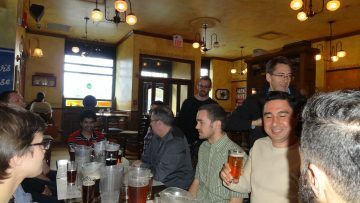 PPC students, faculty and staff share a cheer with Trevor at a pub.